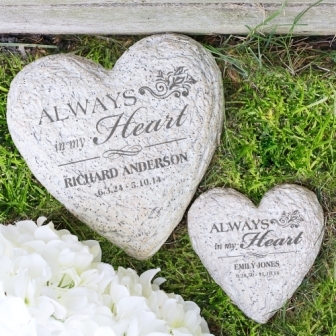 This Heart Memorial Garden Stone is made of durable resin and has a real stone look. It's lightweight, waterproof and comes with 2 great sizes. Our small heart stone measures 5.5" and our large heart stone measures 8.5". This Garden Accent Stone is designed for indoor or outdoor use. The engraving is highly detailed and durable with color and texture variations.